Most audio power amplifiers use class A circuitry except in the drive and output stages, where they use class B or AB operating modes to achieve high efficiency. In class B and AB modes, the output stage operates in a pushpull configuration, where one set of output devices delivers positive voltage and current and another set delivers negative voltage and current. When one set is working, the other set is turned off. This scheme operates efficiently, but has two serious flaws, the extremely nonlinear characteristic of the transistors at the collector cutoff region and the turn-on/turn-off times of the devices. Designers of transistor amplifiers have tended to use large amounts of negative feedback to correct for the nonlinearities, but this works well only at low frequencies. At high frequencies, the feedback loop is unable to make adequate corrections, and the distortion that occurs at the output is aggravated by overloaded front-end circuitry. The usual total harmonic and intermodulation distortion figures do not reveal the abrupt output stage distortions accurately because of the averaging factor involved in such measurements. A spike of crossover distortion may reach 2 per cent, but if it occurs only over 5 per cent of the waveform, it averages out to a respectable 0.1 per cent distortion figure. Considering this error factor, it is easy to see why two amplifiers with the same specifications can sound so different. To properly evaluate the distortion, peak distortion and harmonic distribution must be considered. Typical class A amplifiers will exhibit low order harmonics, and their peak distortion is less than twice the average distortion. In class AB amplifiers, very high orders of harmonics occur, and the peak distortion can be as much as thirty times the average distortion. Another problem common to class B and AB output stages is due to the unequal turnon/ turn-off times of the transistors. Because the turn-off time is greater, both transistor sets can conduct uncontrollably under high slew conditions, making it dangerous to operate the amplifier at high frequencies, a particularly bad problem with some quasicomplementary designs. In a class A output stage, however, there are no abrupt nonlinearities and no turn-on/turnoff delays. The smooth transfer characteristic yields low order harmonic distortions, and these harmonics can easily become unmeasurable at low power levels. In the course of our research, we developed a small class A power amplifier which delivers 20 watts into 8 ohms. It offers excellent performance over a wide bandwidth, and the design is simple and stable enough that it can be built by the advanced constructor at low cost and with a minimum of test equipment. The parts utilized are usually available off the shelf from Motorola and RCA distributors, and the design will accommodate the usual variations in components without problems, so that it is unnecessary to select semiconductors for particular characteristics. 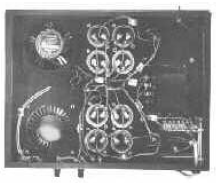 A stereo version of this amplifier can be built for approximately $200.00. 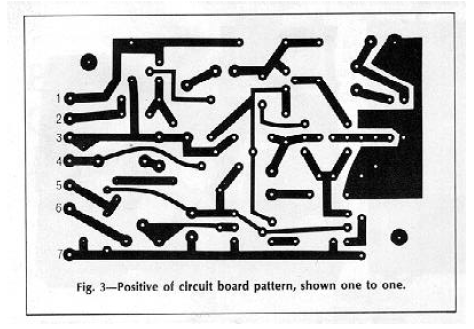 The basic circuit configuration is shown in Fig. 1, where an input differential transistor pair drives a current-sourced transistor, forming the two voltage-gain stages of the amplifier. 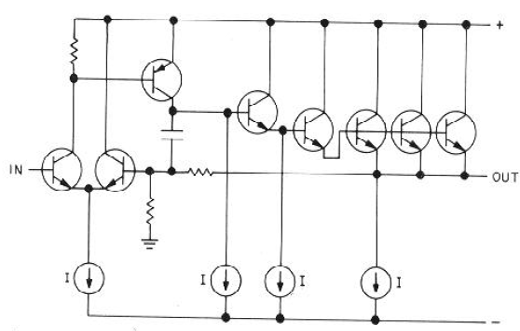 The output of the second voltage-gain transistor drives a triple emitter-follower output stage, which provides a current gain of somewhat less than a million. The four current sources in the circuit are used to simultaneously increase the bandwidth and linearity, accomplishing this by idling semiconductors at currents much larger than the currents required to drive the amplifier. With the exception of the output stage, the gain transistors operate with only small variations about their operating points. The compensation capacitor shown in Fig. 1 is used to provide damping for the circuit, eliminating overshoot and ringing in the output. Its effect is the reverse of the usual lag compensation employed in transistor amplifiers because it actually reduces transient intermodulation effects by creating an internal high frequency feedback loop similar to the damping circuits found in servo systems, where the front end of the amplifier can satisfy its own loop requirements at high frequencies, avoiding front-end overload. 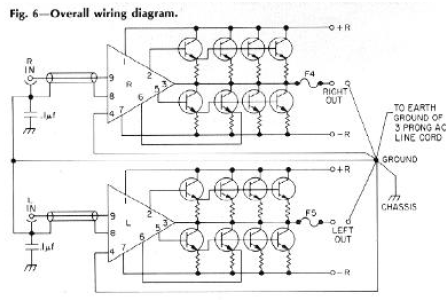 The schematic of the actual amplifier is presented in Fig. 2. The transistors Q3,6,7,13,14,15,16 form the current sources of Fig. 1. Their current value is governed by the active voltage source of Q8, where the circuit is stabilized by taking feedback from R22. This current sourcing system accurately tracks the current value once it is properly adjusted. 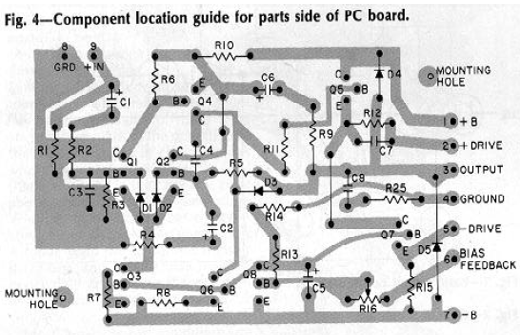 The one-toone circuit board pattern and an upsized parts location guide are given in Fig. 3 and Fig. 4. The location of the parts is self explanatory, except that Q5 and Q7 must be fitted with heat sinks. Reasonable care must be taken to avoid overheating the semiconductors and other components during soldering, and high-wattage soldering guns must not be used. If any substitute transistors are used, it may be necessary to adjust the values of C7 and C4 for stable operation using an 8-ohm non-inductive load and driving the amplifier with 100 kHz square waves. If the amplifier should exhibit high frequency oscillation, increase the value of C4 or decrease the value of C7. For this amplifier, there is no such thing as too much heat sinking for the output stage. Extravagance in this area is no vice, and good ventilation is similarly very important. 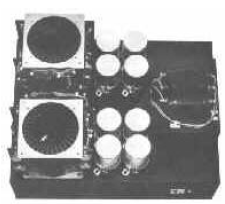 The use of more than 100 square inches of black-anodized aluminum heat sink per output transistor should allow for operation without a fan. A safe rule of thumb by which to evaluate the quality of heat sinking is to see whether or not you can place your hand on the heat sink without hurting yourself. The heat sink should be grounded to the chassis of the amplifier, and heat-conducting insulators must be used with a liberal quantity of silicone grease between the heat sink and the output transistors. Figure 5 shows the power supply for a two-channel system which will allow different supply voltages for optimization of the output power versus load impedance. The 105 volt primary tap of the transformer will serve for 8-ohm loads, the 115 volt tap for 6-ohm loads, and the 125 volt tap for 4-ohm loads. With a 120 volt a.c. line, the maximum power yield is 20 watts per channel into 8 ohms, 24 watts into 6 ohms, and 28 watts into 4 ohms. To alter the amplifier for optimal performance into a given load, the tap must be changed and the amplifier must be rebiased. If the diode bridges in the power supply are not mounted on a metal chassis, they too must be provided with heat sinks. Use 16-gauge wiring in the power supply and amplifier output connections, while 24-gauge wire is adequate for other connections. It is important that all of the ground connections be shared by both channels at one point on the ground bus. The ground bus must connect all four power supply capacitors and be of heavy gauge. Additional wiring information is given in Fig. 6, where the grounding and power connections are to be followed literally for low noise. At the input connectors, the ground of the input is physically isolated from the chassis. A 0.1 uF capacitor connects each input ground to the chassis at the input and is used to eliminate r.f. pickup. Biasing the amplifier is quite easy with either a d.c. voltmeter or an oscilloscope. Before turning on the amplifier, R16 must be adjusted for maximurn resistance (minimum bias current). If the bias is set too high, the negative power supply fuse will blow without damaging the circuit. If this occurs at one extreme setting of the potentiometer, replace the fuse, set the pot to the other extreme, and try again. After the amplifier is turned on and doesn't blow the fuses, the bias must be set by adjusting R16, preferably using an oscilloscope. Using an oscilloscope, the bias is adjusted by driving the amplifier with a sine wave into the appropriate load resistor value. Set R16 so that the amplifier clips into the load on the negative half of the wave before the positive half clips. Then operate the amplifier for 15 minutes without an input signal. After 15 minutes, readjust the bias for symmetrical clipping of the circuit when it is very slightly overdriven. Repeat the adjustment again in 15 minutes to insure that the heat sinks have reached thermal equilibrium. If using a high quality d.c. voltmeter, the bias can be adjusted by a similar procedure, measuring the voltage occuring across R22. For an 8-ohm load, the voltage across R22 should be 125 millivolts. For 6 ohms, the voltage is to be 170 mV, and 220 mV for 4- ohm loads. As before, the bias must be adjusted slightly low and increased slowly to the proper value after the amplifier has warmed up. The voltage should be monitored and adjusted periodically over a half an hour or so. 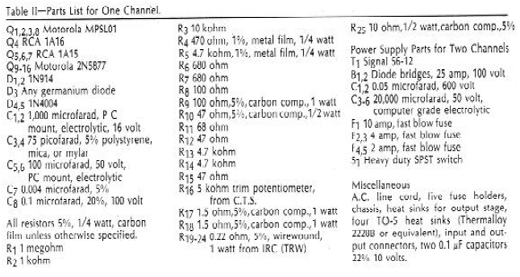 figures shown in Table I.
remain virtually unchanged with fully reactive loads, and we were unable to detect a significant difference in harmonic amplitudes between an 8-ohm load and a 2-microfarad capacitor driven at 10 kiloHertz. 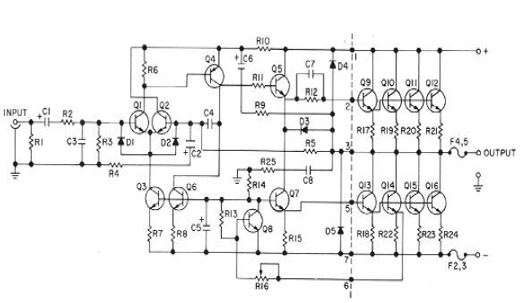 The amplifier cannot be damaged by shorting the output or by overdriving the input. It does not require a load for stability and can be safely driven into any load at any frequency. The components are chosen for very conservative operation; for example, the output transistors are operated at a third their rated voltage, a tenth their rated continuous current, and about a tenth their dissipation capability, insuring a long life span for the amplifier. After extensive listening tests, we concluded that the sonic purity of the amplifier more than justifies its high power consumption (less than a color TV). The sound is neutral, and we have found it useful as a tool in evaluating preamplifier circuits, as it outperforms quite a few of them. It also serves well in driving electrostatic headphones and as the high frequency driver in a multi-amp system. Freq. Response: -3 dB at 0.33 Hertz, -3 dB at 500,000 Hertz. Damping Factor: 100 from d.c. to 50,000 Hertz. Noise: 0.8 millivolt at the output, primarily 120 Hertz. Harmonic Distortion: Below clipping, harmonics are limited to second and third; all other harmonics were below our 90-dB test residual; at 16 watts, 20,000 Hertz and 8 ohms, -73 dB second, -74 dB third; at 10 watts, 20,000 Hertz and 8 ohms, -75 dB second, -75 dB third; at 5 watts, 20,000 Hertz and 8 ohms, -76 dB second; at lower frequencies and power levels, the distortion becomes very difficult to measure accurately. Miscellaneous AC line cord, five fuse holder, chassis, heatsinks for output stage (Thermalloy 2228B or equivalent), input and output connectors, two 0.1uF capacitors 22%, 10V.